Quick selfie-Saturday with some of my mandalas and some candles lit in gratitude for you all! Our week together is coming to a close, and today is the last day of the #InstajoyProject. Thank you all so much for a wonderful week. I hope it has been a positive, enriching creative experience for you all. Here's a video for our final day, with a message for you all! As I said in the video, today's task is to reflect on your week of creativity and to begin to look forward to 2016, thinking about what you would like for your life in the New Year. Some intentional reflection. Start by reviewing the week that's been. How has the #InstajoyProject experience been for you? How has it felt to regularly include creativity in your life? How did it go? Here are a couple of questions to guide your reflection - journaling or writing the answers down is a great idea. What went well in your creative practice this week? What could be improved, or what would I like to change? What do I need to put in place to move forward as I would like to? Many of us are already beginning to think about 2016 and what we would like to invite in for ourselves in the New Year. I think back to when I was younger, and New Year was focused on parties and the most popular (and crowded) holiday spots. I can't tell you how much of a relief it was to get a little older, find the online personal development world and realise that you could approach the New Year a whole different way! Taking some time to soulfully review the year that has passed, before developing a set of intentions for the new year is definitely my idea of a good time at New Year now! There are a host of planners and workbooks out there to help guide you into a new year - and lots of them are free (I've done Susannah Conway's for several years). I highly recommend developing your own ritual or tradition to usher in the new year. Do you have a project or product you would like to birth into the world? Is there a hobby or medium you've been dying to try? Do you want to increase the levels of creative thinking in your work? Would you like to change your work entirely to something that is more fulfilling? Would you like to be more creative with your children or grandchildren? Would you like to use creativity to increase your self esteem, mindfulness, productivity or wellbeing? Have you got arty UFO (unfinished objects) at home you would like to complete? Once you have your list, check in with how you're feeling. Excited? Scared? Doubtful? Determined? Notice what you tell yourself about your list. Then, either working with your whole list, or with one item of your choice, write down the answers to the following four questions. Answer each question with the same item from your list, so you get a full picture of the different results/consequences. This simple exercise is a great decision making and motivation tool! What WILL happen if I do... (insert item from your list). For example - What will happen if I do write my book? What WILL happen if I don't...(insert item from your list) e.g. What will happen if I don't write my book? What WON'T happen if I do... (insert item from your list). e.g. What won't happen if I write my book? What WON'T happen if I don't... (insert item from your list). e.g. What won't happen if I don't write my book? This tool is a great motivation and clarity tool, so it's excellent to use if you feel unsure about whether you want to add something to your 2016 list of goals and intentions. I would love to hear what plans you have for your creativity in 2016 - do let me know! And please remember, I would love to stay in touch with you all, it would be great to see you in future editions of the #InstajoyProject. And of course, I'd love to see you in some of my paid programmes as well: a reminder that my 25% off all coaching packages lasts until 6 December only, as does the introductory pricing of $57US for Anchors and Wings. Please scroll down further to the Day 6 post to see details of the offers. Thank you all again for being here, and for your wonderful contribution to the #InstajoyProject. I have loved working and sharing with you all! Welcome everyone to Day 6, and a special welcome to the people who are still joining us... even on the second to last day of the #InstajoyProject. As much as I hate to mention it, we are nearing the end of our week together, and I am turning our attention to themes that will help us once we move beyond our time together. My hope is that this week is the start of something bigger for you: that you will continue developing a creative practice, continue nurturing your creativity. Several people have commented on Facebook that they hope to stay in touch after this week, and our Facebook group will remain. You are welcome to connect there and continue to share. I hope to stay in touch with you all. I will run further #InstajoyProjects in the future: these will utilise our same Facebook group so be aware our group will grow. I'll keep you on my mailing list, so will let you know when new projects are coming up. and you will be welcome to join in. I've also got some exciting opportunities coming up that I'll share more about at the bottom of today's post. First I wanted to talk about two themes that have come up for some people during the week, and which I think are relevant to us all. The first is gratitude and the second is what to do when it all goes wrong. The fact that it's Thanksgiving along with all of your wonderful feedback and comments have brought gratitude to the fore today for me. Practising gratitude goes beautifully with a creative practice because gratitude helps us appreciate everything more - especially when the going gets tough. We've seen a comments this week from some of you realising how hard you can be on yourselves: how high your expectations are, how disappointed you can be when things aren't perfect. When we're being mindful, we're much more able to recognise thoughts that are unhelpful to us - thoughts that leave us dissatisfied with our efforts, sabotage our progress, or that even prevent us from trying at all. First, catch the negative or unhelpful thoughts - notice when you have them. Don't criticise yourself for them. Just say 'That's interesting' and focus on what you can do to change them. Because - you know, life. Some days, it just won't work out like you'd hoped. And that's okay. Life or the Universe goes crazy for a moment - things get in the way. These are the facts of the busy, full lives we lead. But I wanted to take a moment to remind us all, that every day, and every moment, we begin again. Just because something didn't work out as we hoped (there's that attachment again) it doesn't mean it's all a flop and we can't try again! I hope that looks silly written down on the page - as if one little setback would stop us from maintaining our creative practice! Ha! And yet... that's what happens sometimes. It's a bit like being on a strict diet for weeks, and then the floodgates open because you slip up and sneak in that one bar of chocolate... So here are a few tips for getting back on the horse if it all goes awry. Be determined and resolute in your commitment. You're doing this for you, and you are so worth it! If you're wanting to go on in your creative practice and are wondering what is next, I wanted to offer some super-exciting specials just for my wonderful #InstajoyProject women. My signature 1 month Creative Coaching package. This comprises 4 Skype or phone calls in a month. The timing is perfect to finish 2015 strongly, and then cement a transformational creative practice for 2016. My VIP Virtual One Day Retreat. This package is like a day-spa for your creativity. We work together for a whole day via Skype (with breaks!) We work on anything and everything of your choice - unlocking creativity, dissolving blocks or making progress on a specific project. Read the full descriptions of these two packages by clicking on the links in their titles, and send me an email at hello@katherineparrott.com by Sunday 6 December to get your special discount code. Anchors and Wings - My Signature Course, Coming February 2016! I am so excited to announce that on 1 February 2016 I will be launching a new course, and I would like to offer #InstajoyProject members the first opportunity to enrol! I haven't announced it anywhere else yet, but I would like to offer you special introductory pricing of $57US (it will be $75 at full price). Anchors and Wings is all about grounding ourselves in a creative practice so that we can give flight to the projects, work or artistic mediums we're passionate about. It's about developing the skills, habits and attitudes we need to achieve our dreams - and then getting it done. I will share the knowledge and the how-to of my creative career: I'll give you the best of what I know about creativity and how I've made it one of my super-powers. You can work on whatever you wish, this course doesn't have a specific theme like making mandalas. Anchors and Wings is about developing our creativity, no matter our medium - because the truth is, we use creativity in everything! This introductory pricing is available to you all for one week only - until Sunday 6 December. To enrol, please email me at hello@katherineparrott.com and I'll send you your special discount voucher! As well as being an artist, writer and creative coach, I am a certified NLP Practitioner with a background in adult training and development. I am triple degree qualified in Commerce, Physical Education and Leisure and I’ve combined my business and what I love ever since. I started my career in non-profit, transitioned to business, and then worked in marketing, training and personal development. For the last 7 years, I’ve followed my entrepreneurial heart, creating my business. In that time, I’ve looked after seven-figure marketing budgets for clients, written strategy for national organisations and completed artworks that have travelled the globe. My latest projects include starting to write a book, while stepping deeper into all things creative and sharing my art around the world. My mission is to create a global community of women who are honouring their creativity, utilising it as one of their super powers, and going after all they desire in their lives. Happy Friday everyone! I hope you've had a wonderful week... And I so hope you've enjoyed the richness of our creative time this week. I know my head has been buzzing with mandalas - so much so that I'm going to be creating a new range of fine art prints from the mandalas I've made this week! Each print will be hand painted, and I hope to get some completed before Sunday so I can show you. I've also noticed that I'm starting to feel constrained by A4 size paper... so I've picked up some A3 watercolour paper and soon will begin making larger scale mandalas. I can lose many happy hours working on my mandalas... so perhaps it will morph into days once I'm working in larger sizes!! Today's theme for discussion is space - perhaps that should be S. P. A. C. E.
Specifically, when we enjoy creativity, when we know it helps us feel good - how can we consistently create the space for it in our lives? Space comes in different forms, so have a watch of today's video, or read on to see what I mean. Making space is both a physical and metaphorical concept. Here are some of my favourite ways to create space. While many of us won't have a dedicated creative studio or space, it is helpful to organise a space where you can regularly create - even if this is a tiny corner. Declutter - let go of what you no longer need. Be aware of your thoughts and thought patterns. Listen to your self talk and change any negative self talk for positive. Especially at this time of year when we can be pulled in multiple directions, take a moment to calm your busy 'monkey' mind. Stop. Pause. Get the to-do list down onto paper, so it stops cluttering your mind. Drop the 'should.' This time of year can contain lots of things we 'should' do. Keep your focus on what you would truly like to do, and let the 'shoulds' go! The most valuable tool I use to make emotional space is grounding and centring myself. There are many different ways we can ground and centre, and we will each have our favourites. I like to get outside, look up at the sky or stars, connect to ME via my sense of place. I put my bare feet on the grass, the soil, the sand or water. Most importantly, I return to what I carry with me all the time - my breath. So often, we forget the importance of breathing. Before I started yoga, I wasn't even aware that I didn't breathe properly. Many of us do shallow breathing, and can gain huge benefits from simply breathing deeply and slowly. Stop. Pause. Sit or stand up straight. Take time for 5-10 deep, slow breaths. Feel your breath travel all the way down into your abdomen - right to the bottom. Feel your chest expand, let your belly be soft as you take your breath in. If you like you can imagine yourself filling with golden light. SEE the air filling you with life and calm. I find when I'm particularly busy, (and bordering on overwhelm) my energy can feel very cluttered, which ultimately makes me feel constricted. Tune in to your own energy for a moment, and see how you feel. If you were giving off an energy field right now, what would it look like? Return to what you know is true for you. Choose to use your energy - right now - for one thing (even if it's tiny) that channels your energy in a good way. This one tiny action can charge your energetic state, almost like pushing our own reset button. Your action could be creating something, writing a small affirmation down for yourself, give someone you love a hug and be embraced in return. The options are endless - just find one action that feels truly you. Choose to calm your own spirit, and nurture yourself. I'm a work in progress today! Well... we're over half way now! And what an evolution we're seeing in your mandalas. I can't say enough how great it is seeing them all unfold. One of the things I love the best is the differences between everyone's styles... we all choose different shapes and combinations, and our style becomes unique to us. Sorry, I haven't made a video to go with today's theme, as I spent all of yesterday travelling. It also meant my mandala for today is still a work in progress - I'll complete it over the day! Some of you will be quite comfortable calling yourself an artist, others will have some hesitation using the 'A' word, or won't even have thought of applying it to themselves. I know it took me some years before I fully stepped into my calling as an artist. But I think we're all artists and craftswomen of something - not least of our lives. Whatever stage we're at, there's one thing I think is common to us all - we're all still learning and growing. I'm willing to take a bet that many of you love learning just as much as I do. Throughout my life I've lapped up knowledge like it was going out of fashion. Three degrees and a lifetime of informal learning STILL leaves me hungry for more, and learning is one of my greatest sources of inspiration in my creative practice. If you're looking for a way to keep the spark in your relationship with creativity, here are some things to try. You can bring these ideas to your mandalas, your creative practice, your life in general. Start to look for your signature style. What makes your work uniquely yours? How can you magnify or expand on that? What brings you the most joy or ease? Do more of it! Go looking for learning: books, magazines, YouTube, online classes, in-person workshops... there are so many different ways to learn! Take yourself on an artist date (as coined by Julia Cameron). This is a date for one - just you, and a creative activity or outing of your choice. Pick something you're curious about, that you've always wanted to try, or that is pure fun! Day 3 - still haven't got to colour, but digging the black and white! Hello again everyone - we're almost half way! Here's another video for today: I'm talking about developing a creative practice. Earlier this month I wrote an article for the Huffington Post called 'Maximise Your 2015 Achievements and Staying Calm Through the Festive Season by Getting Creative.' (You can read it if you like by clicking on through). One of the main points I made in the article was that creativity replenishes what life depletes. As women, we often intellectually understand the importance of self-care... but in the busy-ness of life, find it hard to consistently put into practice. I've noticed that many of you in the group do work that helps and serves others. When our mission is to serve, it makes our own self care even more important. Add the festive season to the mix, and every minute of self-care we can give ourselves will pay double dividends! To be a truly effective part of our lives, and to develop our creativity as one of our super-powers, creativity is best included as a regular practice. Here are my top tips for making creativity a habit that will last. Some you'll recognise because I've mentioned them already! Aim for (and recognise) small amounts of progress - one forward step every day, no matter how small. Even if some days that means all you managed was to buy some new art supplies, or five minutes of creativity. It all counts, and small snippets add up. Our lives are made of those small moments! Have a project or something you're working towards. e.g. a Photography 365 project, or putting some work forward for an exhibition. So there we have it! Think today about how you can make creativity a habit in your life. I liken my creative practice to a spiritual practice: it is critical in maintaining my wellbeing. I'd love to hear your thoughts in the comments here, or in our Facebook group. I hope you've all enjoyed the first day of our week together. I've made another quick video for you all today, as I have two key tips today. Several of you commented yesterday that you moved through stages of loving, hating and then back to loving your mandalas again - and this is totally normal! I always think of Michelangelo when I hit a difficult stage in a creative project. As we know, he was an incredible sculptor, and all he wanted to do was sculpt. But he was also an incredible painter, and the pope of the day essentially forced him to paint the ceiling of the Sistine Chapel. Michelangelo didn't enjoy the project - which took years to complete - but he pushed through and created a masterpiece that has been admired by millions of people since. So I take heart from Michelangelo - that even on days when I'm struggling with the next steps on a project, if I just keep going, and let the next steps unfold, I'll get to my masterpiece at the end! Of course, this is true for our creativity, our art, and our lives as a whole. Often the feelings and responses that show up when we're creating also show up in other areas of our lives. So far, I've seen comments from people about being scared, wanting their mandala to be perfect or amazing, needing to free up. On the flip side, others talked about getting into creative flow, being in a beautiful meditative state, being so 'in the zone' they were barely aware of the outside world! When you make your mandala today, observe what's coming up for you, and while you create, you can think about where this same response shows up in your life. How can you release, let go, or bring more ease into your creativity and life? Mindful creation is the first step, and transferring our learnings into the rest of our life is the next step! I would love to hear any comments or reflections you have while you make your mandalas today. Someone said once that your art isn't finished until you love it, and that we shouldn't stop until we love each piece. I think the same is true for our lives! This leads me to the second point for today, and the question of how we make changes in our lives. In the lead-up to this round of the #InstajoyProject, I talked about using mandala making to help us finish the year calm, mindful and strong. When you're making your mandala today, it would be great to spend some time thinking of an intention you would like to take into the rest of this year. With the 38 days we have left of 2015, what would you like to achieve? What will you do to get there? How will you be? The benefit of setting intentions while we're creating, is that we are often operating from a relaxed, open space. When we let go, and create without overthinking, we also access our unconscious mind, which helps ideas, thoughts and solutions come to the surface. Creative time is a great time to tune in to your true self, listen and ask for answers. I would love us to start some discussion in the Facebook group or on Instagram about our intentions for the remainder of the year. Let us know what you're thinking and feeling! Hello there gorgeous mandala maker! If you've found your way here, you're underway on our wonderful week of mindful creativity. 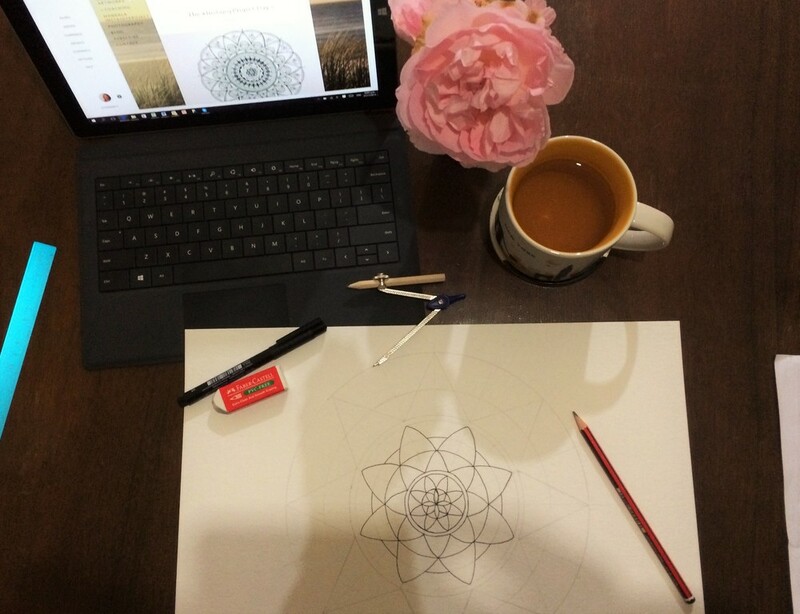 I've created this blog specifically for our Creative Mandala #InstajoyProject. It is where my instructions for making mandalas will sit as I felt they were too long for one email, and I wanted you to get all of my best tips at the beginning of your week! In the meantime, click the video below to watch my welcome to you all. It is so wonderful to have you here! You're about to enter your creative cave... so spend a few moments centring yourself, letting the events of the day drop away, and relaxing. I spend a few moments making sure my environment is conducive to creativity: I clear the space so I have room to work, and often light a candle. You may like to listen to music, or work in peace. I have also got accustomed to asking my loved ones to give me time to create. I tell them how long I'm going to be busy for, and ensure my son has an activity in place that will keep him occupied for that time. I explain that having this time makes me a happier, healthier person. I like to set an intention each time I create. To do that, be quiet, still and listen. Take a couple of deep, slow breaths: breathe deeply, right into the base of your torso. Think about what intention you would like to bring to making your mandala today: let it appear from your unconscious and feel free to go with whatever comes up for you. Write your intention on a piece of paper, and place it where you can see it while you create. I am free to make marks on the page without fear. I give myself permission to have this time. Creativity is divine self care. I do this for joy. I am open to this new experience. I start with a blank piece of paper - plain paper is fine, or because I'm going to experiment with watercolour paints this week, I used a heavy 300gsm watercolour paper. Choose a round object to draw around (or use a compass if you have one. I really must get one, as they would make the process of marking out my circle and guide lines much quicker!) Today I drew around an old china plate that belonged to my grandmother! NB: Use a pencil to mark your circle and guide lines, so that you can rub out them out later. I have only used a pen in this example so the marks were more easily visible for you. Remember that the bigger your circle you start with, the bigger your mandala will be. If you plan to use intricate detail like some of my mandalas, a larger size will take longer to make. Next , place a ruler across the circle, with zero lined up at the left hand edge of the circle. Starting from the middle of your circle, mark intervals at which you will make additional guide circles. The intervals need to be equidistant either side of the centre. e.g If the middle of your circle is 9cm, and you want your first guide circle to be 1.5cm away, make a mark at 7.5cm and 10.5cm. Work your way out, choosing distances that feel right - there is no right or wrong. Smaller spaces between circles lend themselves to a more detailed design. If you want to be looser and larger, use bigger gaps between guide circles. I like to use a combination of thinner and thicker gaps, this allows me to make some big shapes and some small detailed areas. Write these intervals down on a piece of paper so you can use them again. Turn your design 90 degrees, and using your ruler, make further guide marks using your measurements. I find it useful to make these marks in an even pattern (as if I am dividing the circle into half, quarters and then eighths. This helps me design evenly once I start drawing my mandala. As you make more marks, you can see the guide circles appearing. Draw in your guide circles by joining the dots once you're comfortable you have enough marks to draw an accurate circle. You are now free to create your mandala design. I work in pencil at this stage, often creating large parts of my design before I use a pen to go over my pencil marks. Start at the centre of your circle. I often start with a simple, small circle, just so that I have made a mark on the page. Tune in to your intuition and see what shapes you are compelled to make: there is no right or wrong. Start with broader, larger shapes, and add more detail if you wish as you go. Refer back to the intention you set at the beginning if you feel stuck. Release any attachment you have to the result of your mandala - attachment inhibits our creativity. Focus on releasing, relaxing and playing. Think about where you can draw inspiration from for shapes: architecture, flowers, plants, the ocean, geometry, bird and animal life. Google is your friend if you need help: do an image search for 'mandala' and take inspiration from others if you need to. Avoid copying their designs, just take note of what shapes, lines and colours others use. Don't spend too long here, just a flash of inspiration and then back to your own work! You can also google zentangle or henna images for inspiration. Try to keep moving without too much time spent thinking. Allow yourself pauses to consider your next shapes, or to compare options for your next steps, but stay loose and free. I often trial two shape options/ideas in pencil, then choose which I like best. Once I feel confident in the elements I've drawn so far, I go over them in black pen before going on and completing the next stage in pencil. This helps me make some definite decisions (otherwise sometimes my brain would keep questioning and thinking of other options!) Once it's on the page in pen, it's permanent! I usually complete my whole design before I begin colouring in. But sometimes I start colouring before I've completed the design, to help me make decisions and keep moving forward. It's up to you: just listen to yourself and trust. Keep going until you are finished and you feel your mandala is complete: you'll know when that is. Take a moment to step back and admire your beautiful creation! Reflect on the thoughts and feelings that came up while you were making it: you may wish to jot notes in your journal. These may include things you said to yourself as you were creating (positive or negative), great ideas you had, reflections on your intention or something that's going on for you in your life. You may find you feel different now, to when you began. Check if your creative session has any lessons for you to take back into life as you emerge from the creative cave. If you wish, set an intention to take into your life from your creativity. A huge part of the #InstajoyProject is sharing the experience and the joy of creativity with others. Take a picture of your mandala and share it on Instagram, Facebook or both. To share on Facebook, request to join our closed #InstajoyProject group if you haven't already, and then post your picture there. I'll be hanging out in both groups to encourage and comment. Please feel free to share thoughts and reflections as we move through the week.